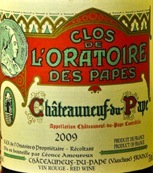 Clos de l’Oratoire des Papes is a classic producer in the Rhone that has grown in reputation since being under new ownership since 2000. Their classic label was created in 1928 and has remained unchanged ever since. The wine is composed of 80% Grenache, 10% Syrah, 5% Mourvedre, and 5% Cinsault and was aged in large traditional oak foudres. On the nose I get beautiful aromas of stewed black cherry, cranberry sauce, orange rind, cinnamon, and a savory soy sauce component. There are also secondary aromas of stone, soil, unsweetened coco and rusty metal. It's a stunning bouquet that continues to develop in the glass and with plenty of oxygen. I'm part of those who can't say "No" when somebody suggest me a glass of wine! That's why I'm always glad to find websites which talk about tips, addresses or reviews. You definitively have to check this one: http://www.frenchcultureguide.com/category/wine/. You will find so much great information!